Select a job and describe the work environment of that job. Weird and wonderful jobs are encouraged but they must be real. This job entails blending ice cream, candy, and all types of syrupy goodness into the perfect dessert so the blenders can be noisy. The kitchen can smell great sometimes but I imagine sometimes it doesn’t smell good at all. The job also involves tasting obscene amounts of ice cream so it gets quite uncomfortable. You have one full week to complete this homework. 2.What hobbies and interests do you have? 3.What school subjects interest you? I'm going to be a nurse. My mum is a nurse and I always wanted to be a nurse just like her. My ambition is to be a Pianist. I have a Grade 3 already and I love playing the Piano. When I leave school I want to go to University and learn to be an Architect. I like cats so something to do with cats would be fun for me. I like to Snowboard I can do a lot of tricks. My pet Labradoodle is my world. He is called Scrappy and I have a blog about his adventures called The Scrappy Book which I update most days with funny pictures or videos of him. I love Lego and have been to Lego events around the UK and even been to the Lego factory in Denmark. My faviourite interset right now is my fidget spinner. I can spin it. At the moment I am really into Trampolining and I learned that the more flexible I am the better I will get at Trampolining. So I am going to start going to Yoga with my mum this week! Social Media is not a Hobby or interest. It's a way to communicate. I like Home Economics becuase I like to cook at home. Numeracy because I am top of the Numeracy Ninjas chart. ...the fidget spinner was the odd one out for question 2! Write a personal statement about your career goals and explain how you plan to achieve them. 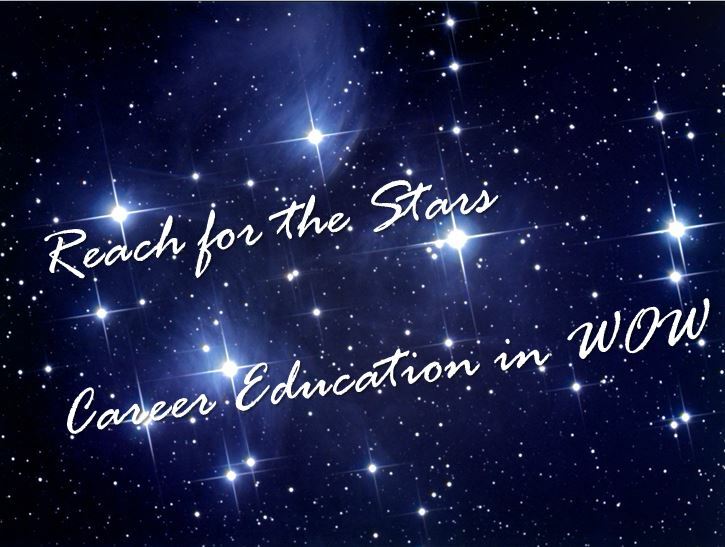 Aim high…reach for the stars! I want to be a hairdresser like my mum. I plan to help her out at her salon on Saturdays. She will let me work there when I am 16. In the meantime I am going to work on my confidence by joining lots of clubs at high school to meet new people. One day I want to open my own salon and also I would like to learn about business skills at college or maybe university. I always wanted to be a vet since I was very young. I have lots of pets; two dogs, one cat, a hamster, three chickens and a gecko. I enjoy looking after my pets but I especially enjoy going to pet shows with t hem. My chicken Arthur goes to Poultry shows and wins prizes everytime. I think owning lots of pets is important as I am learning how to care for different animal. I’m going to go to Glasgow University to study to be a vet so I need to work hard at school. My dream job would be to work at a zoo or safari park. My career goal is to be in the Police. I like the idea of going to work to make the world a better place and I wouldn’t mind working nights or weekends. I am going to join the Police Cadets and I think Modern Studies and PE are important subjects to help me get into the Police. I am running with my dad every Sunday to keep fit and want to work hard in school to leave at the end of fifth year to join the Police. Maybe one day I could have my own private detective company. The best food I ever tasted was at Cameron House in Loch Lomond. The cakes were amazing and we met the Pastry Chef who makes them. He was so interesting that I decided that’s what I want to be a Pastry Chef. I love Home Economics and my teacher says that I can do cake decorating in fifth year and then go to college. I am going to find out more about going to college. I follow famous chefs on Instagram and I even read cookbooks for fun. I spend a lot time with my gran making cakes and we sit down to watch The Great British Bake Off together every week. One day I want to own my own Donut shop, donuts ae my favourite.